Airport transfers | UVO Vervoer B.V.
You can rely on UVO Vervoer for airport pick up services at national and international airports. 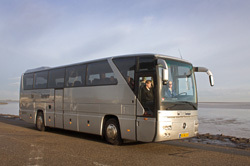 Leaving or arriving at Groningen Airport Eelde, Schiphol Airport, Airport Bremen or Hamburg? UVO Vervoer makes sure you arrive on time and picks you up to bring you home. All the news items and updates of UVO Vervoer B.V. can be seen on the news page. © 2015 UVO Vervoer B.V.